CONTAINS SULFITES found in most wines to protect flavor and color. if you can't moderate your drinking. 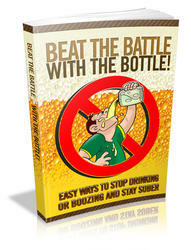 As part of a lifelong commitment, recovering alcoholics and problem drinkers should abstain from any alcoholic drink. Because of the genetic link to alcoholism, people with alcoholism in their family are wise to moderate their intake of alcoholic beverages, too—or avoid them. if your work requires attention, skill, or coordination. Alcohol affects productivity, which can affect your work output and your personal safety. Even with moderate drinking—a glass of wine or beer—alcohol stays in your blood for about one hour, and two glasses, for two hours or more. if you plan to drive or handle potentially dangerous equipment. Even low levels of blood alcohol from a single drink can make you more accident-prone for an hour or so. If you plan to drink, designate another driver from the start who won't be drinking! if you're pregnant or trying to get pregnant. In the United States, drinking during pregnancy is the leading known cause of birth defects. Fetal alcohol syndrome is characterized by mental retardation, and by behavioral and psychosocial problems. While there's not enough proof that an occasional drink is harmful, even moderate drinking may have behavioral and mental consequences. No safe level has been established for a woman any time during pregnancy, including the first few weeks. Too often, women drink before they even know they're pregnant, potentially compromising their baby for life. See "Pregnancy and Alcoholic Beverages Don't Mix!" in chapter 17 for more on fetal alcohol syndrome. Heavy drinking may not be wise for dad, either. According to research, excessive alcohol may decrease sperm count and potency and so affect fertility. if you 're breast-feeding. The level of alcohol in your breast milk will mirror that of your blood alcohol content if you consume alcoholic drinks. And even low to moderate drinking may adversely affect a baby's feeding and behavior. ifyou have certain medical conditions, such as liver disease. Talk with your doctor. ifyou 're on medication, even over-the-counter kinds. Alcohol may interact with certain medicines, making them either less effective or more potent. The medication itself may raise blood alcohol levels or increase its adverse affects on the brain. The result: a single drink will impair judgment, coordination, and skill faster. Check warnings on over-the-counter medications. Talk with your doctor, pharmacist, or healthcare provider about your prescribed and over-the-counter medications. See "Food and Medicine" in chapter 22.
ifyou suffer from allergies. Sulfites in wine may trigger histamine production and allergy symptoms.